©2006 Click image for larger view. Today's chart is another in the coffee theme. It was designed as a mug mat, but can be used otherwise. Thank you for this really cute design. 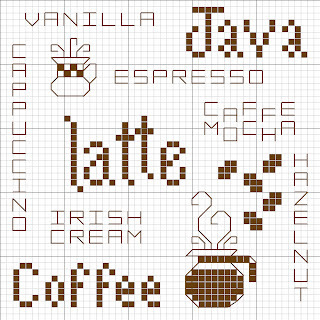 I used this for a coffee themed basket that our 4-H group did for an auction last year and am getting ready to use it again for an exchange with some stitchy friends. Hi, I ran across your amazing blog on Pinterest and I'm so happy I did! I love cross stitch and have been doing it since my mom taught me when I was young :) I do have a question about your site though, how do I open a pattern to print & use it?